Design Control is one of the most critical aspects to consider during the development of a new device. With our team of experts we can support and assist in the whole path, driving the development process on the main road, trough each step, and with the final goal to assure the safety and compliance of the product. The Design History File (DHF; a compliation of documents outlined above). Design plans are to be initiated and maintained, and should also describe or reference design and development activities and define responsibility for implementation. This may consist of Gantt Charts, defined milestones, tasks, timelines and responsibilities. Plans should also be updated periodically. Product developers ensure that the design requirements relating to a device are appropriate and address the intended use of the device, including the needs of the user / clinician and patient, the use environment, as well as meeting the requirements of any applicable standards mandated in the market(s) in which the product will be sold. The developer is also responsible to establish and maintain procedures for defining and documenting design output in terms that allow an adequate evaluation of conformance to design input requirements. Design output procedures shall contain or make reference to acceptance criteria and identifies those design outputs that are essential for the proper functioning of the device. These are then confirmed by verification and validation activities. Formal documented reviews of the design results are to be planned and conducted at appropriate stages of the device’s development. Participants at each design review are to include representatives who can consult and review when they have expertise or input regarding the various stages of design (e.g, one representative may only review one stage, another would consult during a second stage, etc). Also required is an individual(s), who does not have direct responsibility for the design stage, and can provide an independent “voice.” Participants in such review teams may change as development progresses. Verifying, testing, and/or inspecting the device design to confirm that the design output meets the design input requirements (see Validation, below) must be performed on product as close to production as possible. Even actual production samples can be used. Verification steps may involve biocompatibility, sterility, functional testing, packaging / shaking / dropping / shipping and accelerated ageing studies. Electronic products have their own series of tests required by various standards for safety, electromagnetic compatibility (emitting and receiving) and similar. Design validation is to be performed under defined operating conditions on initial production units, lots, batches or any of their equivalents (use of early stage prototypes are to be avoided since this weakens the validation purpose). 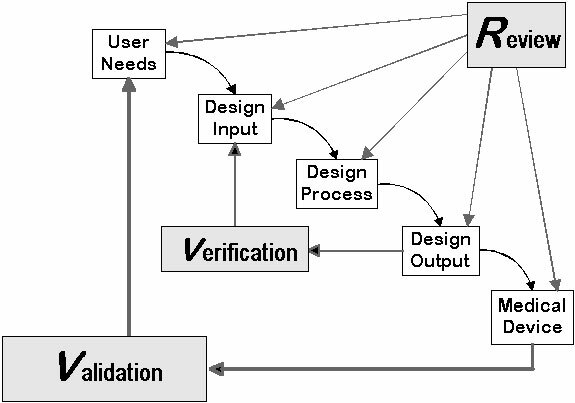 The purpose of design validation activities is to ensure that devices conform to defined user needs, intended uses and applicable standards. Such validation will include testing of production units under actual or simulated use conditions, with such products having been built in a production environment using production / test equipment, and production personnel. Carelessness in these requirements has often resulted in future product recalls. Design validation shall include software validation where appropriate and device risk analysis (re: ISO 14971:2007 and ICH Q9). The results of the design validation, including identification of the design, method(s), the date, and the individual(s) performing the validation, shall be documented in the DHF. Design transfer used to be a major source of quality problems but as companies have moved from “throwing a design over the wall” to cross-functional teams involving R&D, Engineering, Manufacturing, QA/RA and Marketing, such issues have been basically eliminated. Whatever development system is used, the manufacturer ensures that the device design is correctly translated into production specifications. Production specifications then ensure that manufactured devices are repeatedly and reliably produced within product and process capabilities. The process of encapsulating knowledge about the device into written production specifications to which product is periodically tested / inspected / verified against, is critical to device quality. Change control, involving the enumeration of deficiencies and corrective actions that arise from verification and review of the design at its various stages after “start,” and the tracking of their resolution prior to design transfer. All these activities described above are documented in the product’s Design History File.